As far as the vineyard is concerned, winter in the Northeast is a time of inactivity. In the wine cellar it's a completely different story. Harvest in my vineyard starts in late September and runs through the beginning of November depending on the variety. This time period brings to an end the constant vigilance of the growing season but mobilizes the time sensitive, whirlwind of winemaking itself. It's absolutely critical to get the perfecly ripened grapes that you've patiently labored over all season long, crushed and turned into wine as quickly as possible. So from the day of harvest for each variety, your goal is to crush that fruit immediately after picking. The sooner you turn those grapes into must, the less chance they have to degrade or be affected by spoilage organisms and the like. I crush within an hour of completing harvest of any particular variety. Once you have the grapes crushed and in the primary fermentation vats covered, then begins the huge task of cleaning up your equipment and the winemaking area. This is vital to prevent organisms like acetobacter or brettanomyces from invading your cellar to infect your wine, tainting it with vinegar or "barnyard" aromas and tastes. Now you can breathe for a moment. Eveything is clean, the wine is safe and protected from the air. You've given it a dose of postassium metabisulfite (sulfer) to kill of the wild yeasts and you've covered the wine with CO2 to protect it from oxidation. 24 hours later you will add your cultured wine yeast and within a day or so primary fermentaion begins and your grape juice is on its way to becoming wine. The fermentaion vats begin to foam and froth from CO2 produced by the happy yeast feasting on the sugar in the grapes and converting it into alcohol. Now you have another job to do if your making a red wine. It's called "punching down the cap". This is the act of pushing the red grape skins, which have floated up to the top of the vat, back down into the fermenting juice to extract color, tannins and other flavor components from them. This should be done at least three times a day. This is one of my favorite times of the year because the whole winemaking area is filled with the warm, sweet smells of grapes and yeast together. It's a delightful aroma. When the fermentation starts to slow down after anywhere from 5-15 days you have to watch the wine carefully. Up until now the CO2 that has been produced by the yeast has kept the wine protected from air and the molds and spoilage bacteria it contains. Now, as fermentation slows down there is less CO2 and thus less protection. So if you're going to let the maceration continue, you'll have to add CO2 again yourself. Now you have to gear up for work again, it's time to press the wine. You set up your press and secondary fermentation containers such as glass carboys. Pressing you also want to do as expeditiously as possible so as to again, minimize the new wine's exposure to air. You drain off the free run juice that is easily poured from the skins. Then you scoop or pour the remaing skins and juice into the press basket and extract the rest of the wine from it. Now you have glass carboys filled with new wine. You have to top them up leaving not more than an inch of airspace, and then place a fermentation lock in the opening. This will let CO2 out, but no air in. Clean up again, wash and sanitize your equipment, and it's time to open a good bottle and remind yourself why you've done all this work. Your young wine is safely tucked away in a corner of your cellar slowly tranforming itself into something you'll be proud of, hopefully, and you can take a breather now. Really it's the first time you can relax and not worry about your grapes since budbreak. It's a wonderful feeling. Just don't get too comfortable, you've got three more varieties to harvest! Then there's raking, fining and oaking. Suddenly it's mid January, how'd that happen? Ah, but never fear, the winter doldrums will soon be here. I noticed you grow the Regent grape and I was hoping you could give me some information about it. I live in Missouri which is hardiness zone 6 (0 F through -10 F). How cold hardy is the Regent grape? Having it survive the winter is my biggest concern. I know there are other very cold hardy grapes but the wine they produce isn't usually great. Would you say the cold hardiness it is about the same as Cab Franc? More? Less? They grow Cab Franc out here but it takes some work. Burying the grafts over winter, etc... Do you like the Regent grape and does it produce good wine? 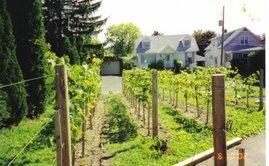 I researched the Regent grape for about two years before I planted it in 2006. Information on the vine is very scarce as you have seen. 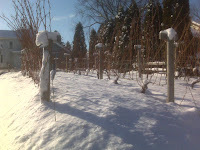 I was able to contact a grower who told me his Regent grapes have been hardy to -14F. I do not know what the bud damage temperatures are or what the killing temperature is. In my vineyard it has not yet seen lower than -8F and it was fine. The vine is a dream to grow, low-med vigor and almost resistant to fungal disease. I got a small amount of fruit from the vines for the first time this year. 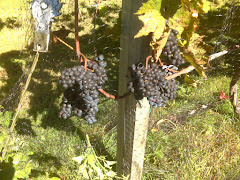 The fruit was very high quality ripened around October 1 with 23Brix and .6 TA. I didn't check the PH. There wasn't enough to make wine with so I put it in with other varieties. The grapes were delicious though with ripe silky tannins and NO vegetal character. This year I'll have enough to make some wine with it and I'll be happy to update you. I think it's hardier than Cab Franc. I would say go for it if your lows are 0 to -10F. I'd love to know how you make out. Best of success to you. Check back in soon! Last time I checked with them they had none. I recently planted 101-14 so I can start propogating and grafting my own. -25F so I need to garauntee the vines survival if that ever happens again. Hopefully it won't. Thanks for stopping by, I hope this helps!